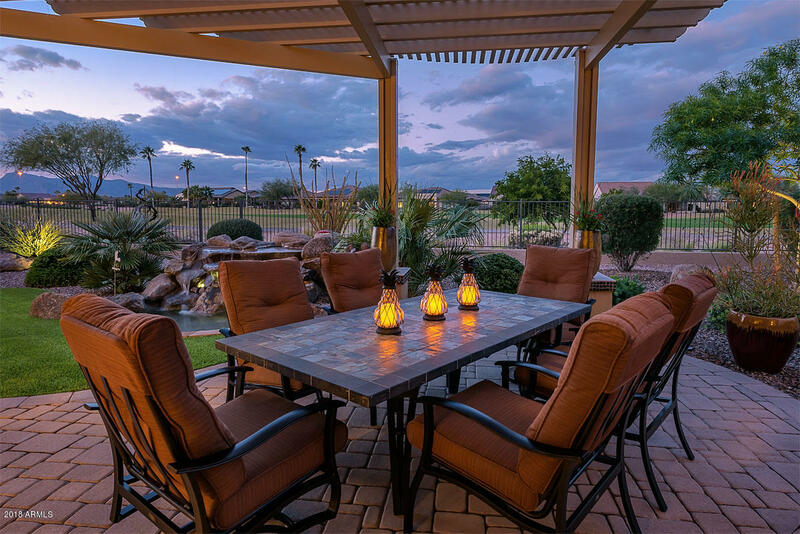 Exceptional home with incomparable NW views of golf course & White Tank Mtns. Large fenced lot is beautifully landscaped with ext, covered patio, pavers, built in BBQ & water feature. Spacious Great Room with built in media center & huge windows to highlight the stunning setting. Entertain on a grand scale in magnificent kitchen featuring slab granite counters, tile backsplash, upgraded cherry cabinets, center island, gas cooktop & double ovens. Fabulous TV room with built in cabinets, bar sink, ice maker, wine & beverage refrigerators. Enjoy the gorgeous views fm master suite w/ bay window; luxurious bath w/ super-sized tiled shower, dual vanities & walk in closet. Home office w/ dual built in desks & cabinets; ensuite guest bdrm + powder room complete this sensational floor plan!